It is our intention to make booking a yacht as simple and pleasurable as possible. Here is a helpful guide to planning your yacht charter. Each yacht is privately owned with an owner that sets the terms of how the yacht is to operate and the associated costs. Ultra Marine Yacht Charters keeps up-to-date records on each yacht in their portfolio and will advise accordingly. The most common terms are outlined below. The charter fee includes the hire of the yacht with all its equipment and the services of its crew including its captain, a chef as well as support crew. 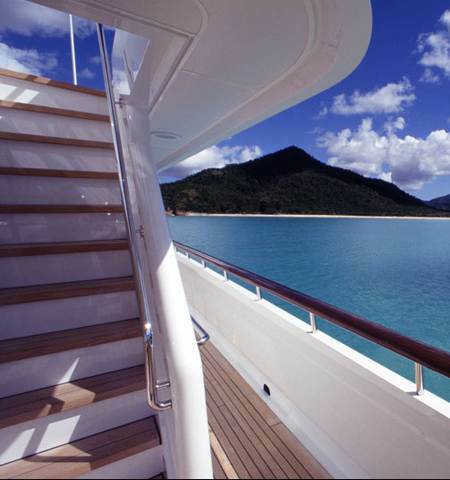 As the charterer you are responsible for all operating costs during your charter. An Advance Provisioning Allowance (referred to commonly as A.P.A) it is used to pay for all expenses relating to your use of the yacht. This includes all food, beverages, fuel for the yacht, its tenders and water toys, harbour dues, pilot and drivers’ fees, water, electricity, national and/or local taxes as applicable, ship agent fees, customs formalities, dockage and all communication costs for the charterers party. A helpful guideline for estimating the expenses is to add on approximately 25-30% of the base charter fee. As the charterer you will be charged, at the cost to the yacht for the expenses you incur as the charterer. The A.P.A is forwarded to the yacht prior to your arrival so that the crew can provision the yacht, make berthing reservations, etc. During the charter your captain will give you discreet updates regarding usage of these funds and if at the end of your cruise there are unused funds the captain will reimburse you. Occasionally the A.P.A is not sufficient and further funds will be required. There may be a positioning or repositioning charge if your charter involves moving your yacht away from its homeport. In most cases the charge is for fuel only. Ultra Marine Yacht Charters recommends that all charterers obtain charterers cancellation and charterer’s liability insurance. We will assist you with these arrangements and provide you with pertinent information. Applicable cruising, VAT, or governmental taxes may be an additional cost. Ultra Marine Yacht Charters remains current on taxation particulars and will handle all the details for you. The rewarding of yacht crews for their performance is discretionary. The standard practice, based on MYBA (Mediterranean Yacht Brokers Association) guideline is to reward anywhere between 5-15% of the base charter rate. This is a general guideline and can vary. We will advise you. Having selected a yacht, your desired dates and cruising location, we will provide you with a formal agreement for signature. At that time, we will request a 50% deposit of the charter fee. Upon receipt, the owner of the yacht will countersign the agreement and the yacht will be reserved for you. The balance, along with the A.P.A (Advanced Provisioning Allowance) and any other applicable fees are normally due 30 days prior to the charter commencement. Once your yacht is reserved, your yacht charter broker will provide you with a reference questionnaire for completion prior to the charter. This will include all your food and beverage requirements, itinerary suggestions, recreational preferences, travel arrangements and any other personal details. This information is sent to the crew so that they are able to customise and prepare the ultimate vacation for you. A yacht charter broker will always be available to answer any questions you may have and make the planning process simple as well as exciting.